Because finding the right daughter birthday wishes is definitely a labor of love for you, your search should start with the best of the best birthday messages for daughters. Look no further — you'll find all the birthday verses you need right here. 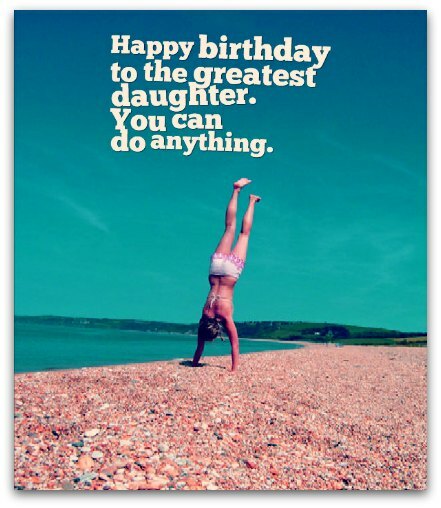 How will you know you've found the right birthday greeting for your daughter? You'll know. It will be the one that completely captures the immense love, pride and affection you have for your daughter. 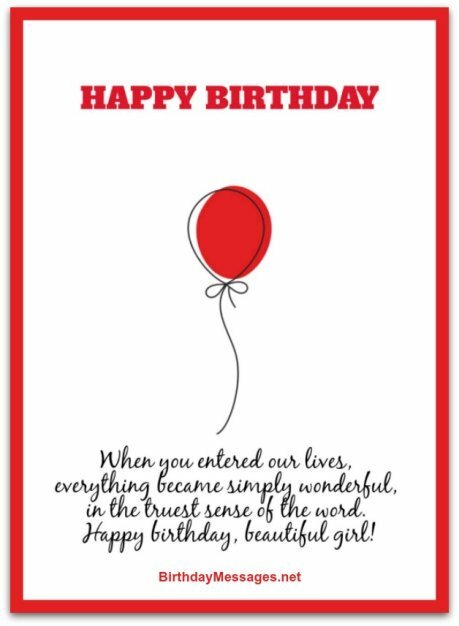 Besides, with such a huge choice of daughter birthday message styles to choose from on this page, it's almost impossible to go wrong here. Start your search for the perfect birthday verse right now. For many people, writing does not come so easily, making it harder to figure out what to put into a birthday card for their daughter. If you fall into this group, it's only natural to feel a little reluctant about writing (or even choosing) your own message for your little or big girl. First, it depends on you as a parent. For moms and dads around the world, messages for birthdays (which come only once a year) are not something to take lightly. They matter. Indeed, what you say or write can inspire your daughter to do great things, move her to tears, give her a much-needed laugh, embarrass her, even freak her out. So it pays to be careful when you choose your words. Am I exaggerating the significance of your daughter birthday wishes? Not all all. For example, according to Psychology Today, fathers, as male role models, have an immense influence on the relationships of their daughters. Click here to find out just how much of an impact dads have. But I digress. Let's get back to the type of message you should select. When you go through the daughter birthday messages below, you should really keep in mind your daughter's age. If your daughter is a youngster, don't be surprised if she cares more about her gifts than the words on her card from you. If your daughter is a teenager, you might want to veer away from overly sentimental messages — teenagers, as a rule, dislike them with a passion. If you have an adult daughter, she will probably appreciate every nuance of your daughter birthday wishes, so you have free rein. Specifically, what's the best route? For children, pick cute and/or sentimental messages that express your feelings. For teenagers, incorporate the "coolness" factor into a sentimental birthday wish, making sure — once again — to express how you feel about her. For adults, you can use any style you want, from sentimental to clever and everything in between, as long as your greeting expresses your feelings (yes, I know I'm repeating myself, but this factor is the most important aspect of any birthday message). Simply start with one of the options below that best captures your feelings...and go from there. Happy birthday, sweetie. You’re far and away the brightest star in our lives! We wish you, as always, a lifetime of love, joy and dreams that always come true! Raising an amazing daughter like you is the greatest accomplishment of my life. Happy birthday, cutie pie! 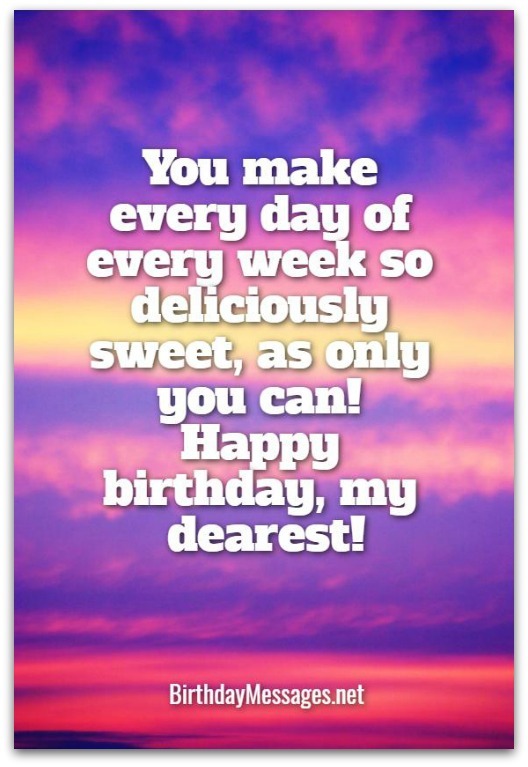 You make every day of every week so deliciously sweet, as only you can! Happy birthday, my dearest! We only have the warmest birthday wishes for you, our sweet little girl! May you have the best of times on your special day! When you entered our lives, everything became simply wonderful, in the truest sense of the word. Happy birthday, beautiful girl! Happy birthday, sweetie pie! We have made many beautiful memories together and cannot wait to create even more in the years to come. Love you forever! May your birthday be as bright as the sunniest day in summer! 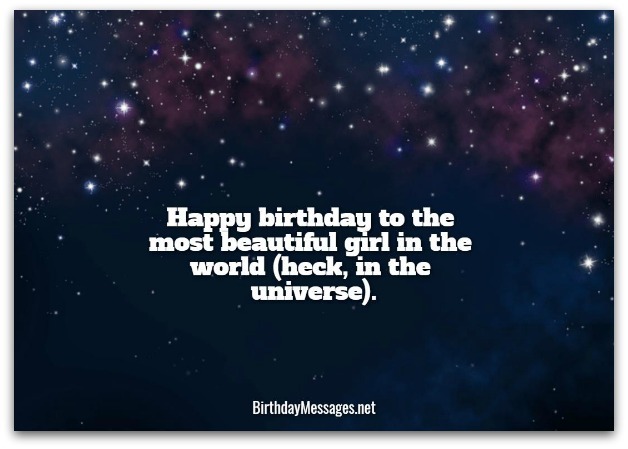 Happy birthday to the most beautiful girl in the world (heck, in the universe). Cutie pie, you make our hearts sing with joy. 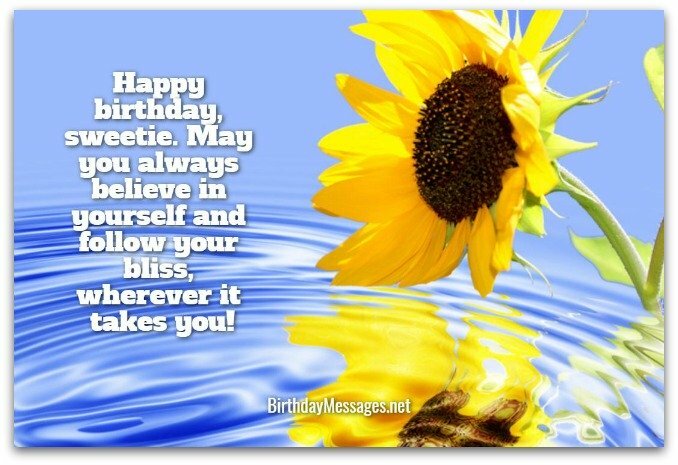 May your birthday and every day afterward be a song of love, joy and beauty. To us and everyone you know, you are the most precious of gifts. Happy birthday, our gift of love. Happy birthday, sweetie. May you always believe in yourself and follow your bliss, wherever it takes you! Wishing you a birthday as beautiful and bright as you, dearest daughter! Have an incredibly wonderful birthday, our sweet little angel. We love you more than we could ever express! Happy birthday to our absolute favorite (and only) daughter in the whole wide world. We love you more than our words can say! Your birthday is indeed the most special day of the year, simply because it’s the day you came into lives and sent us to the moon! On your birthday, honey pie, I want to wish you a lifetime of happiness. Wishing the happiest of birthdays to our beloved, beautiful daughter! Happy birthday, sweetie! You are the greatest source of our joy, pride and wonder. Happy birthday, sweetie pie! I am so grateful that you chose me to be your [Dad, Mom]. Happy birthday, darling girl! You came into my life and changed everything, making me see true beauty for the first time...and every day ever since. Happy birthday to an amazing daughter. You have brought our hearts more joy, sunshine and beauty than we ever could’ve imagined. Having you as my daughter is my greatest accomplishment — and I didn't even do a thing. You did it all, just by being you. Happy birthday, sweetie! Like a cherished memory, you become even sweeter, more precious and lovelier with time. Happy birthday, my sweet darling. I don't know what I did in a previous life to deserve you as my daughter in this lifetime. Whatever it was, it must have been incredible to end up with an incredible daughter like you. Happy birthday, sweetheart! Happy birthday to my precious daughter. Even when I think that you cannot get any more wonderful, adorable, caring and beautiful, you do. You amaze me, sweetie, even when I thought I could no longer be amazed by anything. You've given us something that no one else could ever do — a daughter's undying love, concern, loyalty and devotion. There's nothing greater, nothing more life-giving — except you yourself. Happy birthday, our sweet darling. Sure, you're my daughter. But this is not the only thing that defines you. Your love, your beauty, your caring, your intelligence, your humor, your ambition — those and more add up to the wonderfulness of you. Love you lots and lots. Happy birthday! 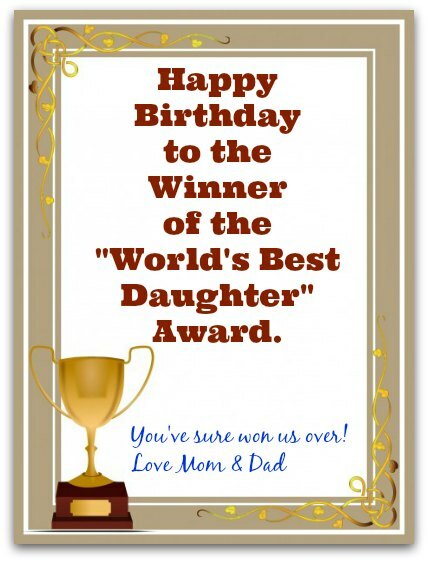 The judges have just made their decision and the winner of the "World's Best Daughter" Award is...you! I just knew you would win. You certainly deserve this title. Happy birthday, my incredible prizewinner! I love you. In my heart, you'll always be my little girl, my beautiful princess. In my eyes, you're a successful, funny, loving, caring, inspirational woman. Either way, you're great. I love you. Happy birthday! There's one word for you. Incredible. I think it says it all. You're incredible in all the ways that matter. And you're my incredible daughter. Happy birthday. I love you incredibly. I’m not just grateful that you're my daughter. I'm grateful for your love, kindness, hope, smarts, friendship, support and, more than anything else, the privilege to give it all back to you. Happy birthday, sweetheart! You make everything about life sweeter than all the candy in the world. Happy birthday, my little sweetie! Happy birthday, darling. You make me smile. You make me laugh. You make me cheer. You make me happy. I will always be there to do the same for you. I don't want your birthday wishes to come true! I want much more for you. I want everybody's birthday wishes for you to come true. I love you. Happy birthday! If I had all the time in the world to write about how I feel about you, I would write a 100-volume magnum opus — and that still wouldn't contain enough words to express my undying love for you. Happy birthday, my sweet princess! Happy birthday, sweetie! You've brought more light into our lives than a zillion suns. You're the brightest part of our day, week, year and lives. Our darling girl, we're so glad you came along. You've made our world infinite times richer than you could ever imagine. Happy birthday! We love you!